League of Angels - Fire Raiders, the award-winning mobile strategy RPG from GTArcade, has attracted millions of players from all over the world. There are many reasons why people have joined this game, and many more reasons why they continue to enjoy this epic gaming experience. With tens of millions of people play League of Angels - Fire Raiders, the game has become a part of their everyday lives. Many players have been playing League of Angels - Fire Raiders for a long time, and the game has become a part of their lives. Players have accumulated tons of personal stories related throughout their journey in Fire Raiders. Sometimes it’s a tale of an epic battle, sometimes it was an inspiring love story, and sometimes it was a funny moment from the game. To the players, League of Angels - Fire Raiders is a game full of memories. Since the release of Fire Raiders 18 months ago, many players have sent their stories to us and we have been deeply moved by these stories. 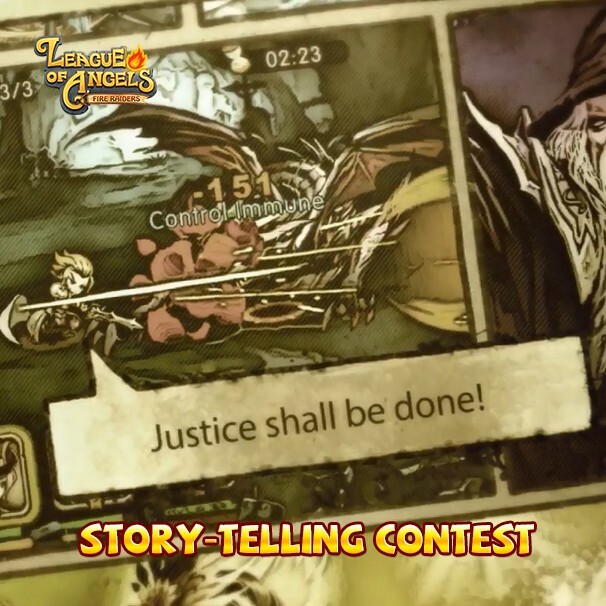 So we thought it was time to hold a story-telling contest in order to let players share their stories with everyone. Through player stories we have felt their love, creativity and passion not only for Fire Raiders, but also for their hobbies, friends, and family. These guys are the reason why our work is so meaningful and why we strive to make the best mobile game out there! Below are just some of the awesome stories happened on in our League of Angels - Fire Raiders! I started playing this game around 2 weeks ago. As a 35year old working mother to 3 boys, I've never played games like this before- I used to only Crush Candy and fling Angry Birds in my spare time. My whole gaming world has changed- or really just begun! On my server, I am the leader of a #7 Guild, #5 in the Arena, and #3 on League and Arena BR. 2 weeks ago I wouldn't have had a clue what any of that meant! Now I am so proud of what I've accomplished and I still have so much more to learn. I'm in awe by this game and am really enjoying playing and learning more about it every day. The graphics and animation are great and I am so happy to have found this whole new world that I never knew existed. My mother and father live separately since I was young. I have a brother that lives with my father and never get along since forever. Long story short, my brother plays the game. I play the game. Now we're like best friends and are now competing with each other. So much fun! Thanks LoA – Fire Raiders! 286 days ago, my favorite guy started bragging LoA – Fire Raiders and offered me her download too. But I'm not a fan of any telephone and other toys, and on this, I laughed with his proposals and refused. But my favorite didn't give up and still got to try to play. In the general level of the level, created a guild and I was in her understand that not the last person and zam-leader. We live together and on this play more interesting, we are with a smile trying to show you what is better than the other, he's bragging about what I am. Well, since this is my first gaming experience - I am treading on my guy. But I don't always happen, and he is. So the game super! I still can't tear myself away from her, and I'm so interesting and not nearly got sick of playing. Thank you so much for such an exciting game! I made many friends by joining a guild, there was once I saw a lovely girl sitting on a bench in a park, I stepped forward and saw her playing this game, now I believe in fate , because she is in the guild I'm in, I went and talk to her and she is my best friend now , I met up with her every weekend and had fun together. Hi, I'm from Colombia, my English is not good enough, please understand me. Once time ago, I meet a girl because of this game, this girl is my girlfriend now, I thanks you for this, I really love this game!! GTArcade is a leading developer and publisher of free online games. With its guiding principle “sharing simple joy,” GTArcade has developed award winning MMORPG and strategy games for browser and mobile platforms around the world. Visit www.GTArcade.com today and play all our games for free! Partake in the gaming experience of a lifetime!